Did You Know, Fay Alexander appeared in the motion pictures "Trapeze", "Jumbo" and "The Greatest Show on Earth". Recognized as one of the most accomplished of trapeze artists, Fay performed with the "Flying Concellos". Fay Alexander was born in Seattle in 1924, the son of a barber. He grew up in Los Angeles. At 3, he contracted a lung disease and was sent to dancing school as physical therapy. Fay learned ballet and acrobatics, he then began to perform in theaters and clubs along the Pacific Coast. During the war, when he was in the Coast Guard, he performed as an acrobat with Rudy Vallee's show, and later appeared in the ''Stars and Bars'' show with Sid Caesar and Victor Mature. He then served eight months of sea duty. After leaving the service, he began performing in 1947 with Ted Dewayne in a Risley act, the acrobatic art of juggling objects -- and sometimes people -- with one's feet. He and Mr. Dewayne then bought some secondhand gear and taught themselves aerial tricks, performing as the Dewayne Brothers. Mr. Alexander toured South America with Jerry Wilson's Flying Behrs and returned to work with a circus that Mr. Dewayne had organized. 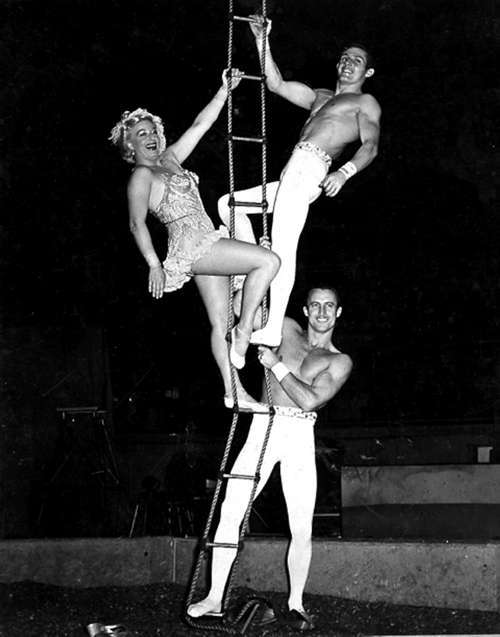 He met Rose Lamont, a trick rider, in 1948, married her and trained her for the trapeze act. On Jan. 5, 1990 Fay Alexander was inducted into the Sarasota's Circus Ring of Fame.